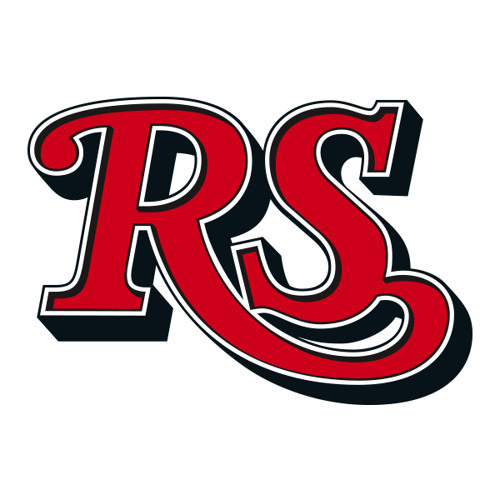 In 2003, Rolling Stone magazine was a biweekly publication that covered music, politics and popular culture. It was founded in 1967 by Jann Wenner and Ralph J. Gleason. Jann Wenner was still the magazine’s owner, editor and publisher then. Making “the cover of the Rolling Stone” was a landmark achievement for music artists. Each issue used to reach close to 1.5 million people. 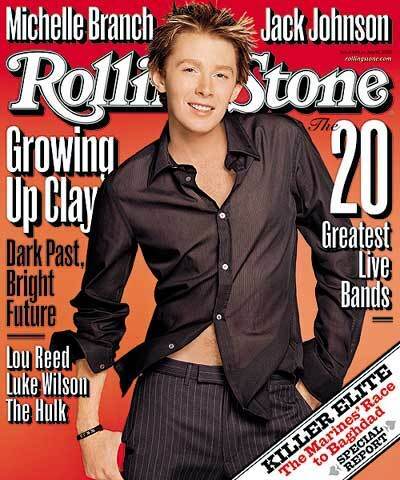 July 10, 2003 was the official date on the Rolling Stone Magazine that featured Clay Aiken on its cover. But, the magazine was available in the middle of June. Many people were surprised when they heard that Rolling Stone was featuring Clay Aiken. His inclusion in this venerable magazine lent an air of acceptance not just to Clay but also to the concept of American Idol. Another question asked was why Clay and not Ruben? Since Ruben was the winner of American Idol, it was a valid question and some Ruben fans were upset and rather vocal about their disappointment. However, Clay’s story was really about the “guy next door” who becomes famous and was a tale that America loved. Clay was entering his last year of college with the intention of becoming a teacher. Clay said that he really wanted to be on The Amazing Race and auditioned for American Idol so his friends would stop bugging him to enter the competition. The general public embraced the young man who seemed puzzled as to why people were so captivated by him. In answering questions about the photo shoot for Rolling Stone, Clay said that the cover shoot for Rolling Stone magazine required 8 hours of work and numerous changes of clothing. He admitted that he was somewhat tricked by the photographer who asked him to put on the black shirt and to not button it all the way down. He didn’t understand why, but quickly understood when they turned on a fan. Clay admitted that he was surprised they chose the photo they did. He said that they only took about 2 photos of him in that shirt. “I don’t know why people get so excited about that picture.” he says incredulously, “It’s just me! Clay was recording his album in London when he talked by phone to WRAL radio about the Rolling Stone experience. He said he really didn’t understand the significance of all of this until Ruben explained it to him. Clay’s fans swarmed the bookstores and newspaper stands for copies of the magazine and many fans turned to E-Bay as a source. 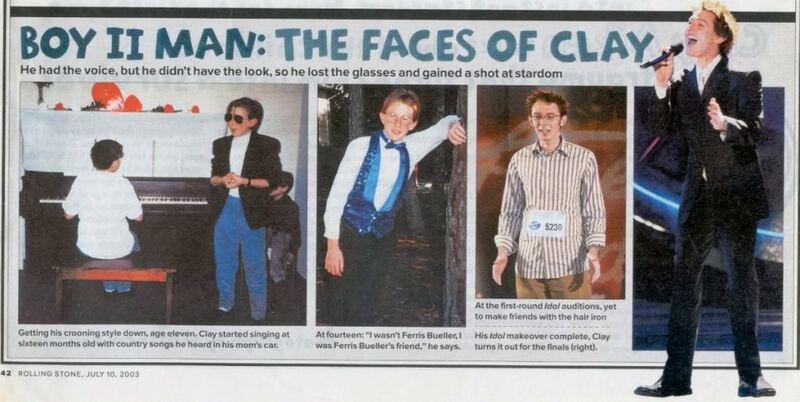 The article, written by Erik Hedegaard, was the first time that Clay opened up about his life before American Idol. The writer was thorough and asked many interesting questions and seemed impressed by Clay’s down to earth attitude. He was treated fairly and with respect. Do you remember the article? Do you still have your copy of the magazine? The following is a fun video of the Rolling Stone Photoshoot. Take a look!! It is definitely remembered and I loved reading the whole article. Clay was amazingly straight-forward with answers and that was very good – and I do still have my copy. Thank you for bringing this to our attention after all of this time – nice to remember! Worn out copy of my Rolling Stone! Love the article and mostly the picture of OMC! That was the only time I bought Rolling Stone Mag. Yes, I still have it. Loved the cover…so different than any other photos Clay had taken…and the story inside. Maybe I'll pull it out today and reread it. Thank you for the video. I did not go out and buy Rolling Stone magazine. I wish I did. At the time I did not buy that magazine. To everyone out there that still has a copy. Lucky you. Error: Error validating access token: Session has expired on Tuesday, 21-Aug-18 16:13:01 PDT. The current time is Monday, 22-Apr-19 07:33:03 PDT.